Input text: The cornsilk clear nautilus is 100 feet deep. it is 60 feet wide. it is 80 feet tall. It faces down. It is -2 feet above the ground. The ground is entirely shiny navy. The camera light is gray. There is a huge man. He faces the nautilus. He is on the ground. He is 10 feet northeast of the nautilus. The sky is rainbow. The man is shiny gray. The hair of the man is blue. The sun is white. It is noon. The very small volcano is entirely solid gray. It is unreflective. It is 16 feet west of the man. The huge black "?" is 1 foot above the man. It faces east. The "Your life is a mountain built one pebble at a time." is 6 feet south of the "?". It is white. It is 48 feet wide. It is 2 feet deep. It is 4 feet tall. It faces east. It is 5 feet above the "?". It is shiny. 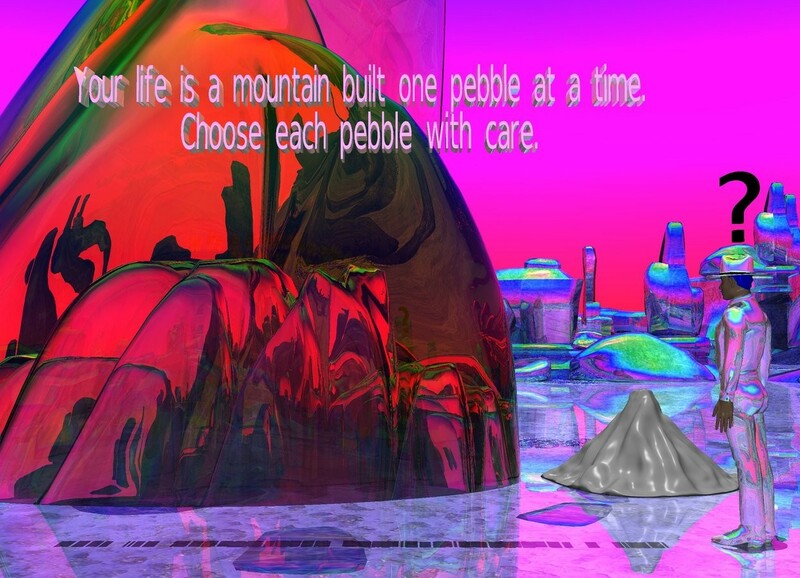 The "Choose each pebble with care." is white. It is 2 feet deep. It is 4 feet tall. It faces east. It is shiny. It is 30 feet wide. It is -8 feet above the "Your life is a mountain built one pebble at a time." @nanook It's a nice change of pace from my old "hit the bottom hard if you wanna bounce" phase, ain't it? a new zen pearl of wisdom ! 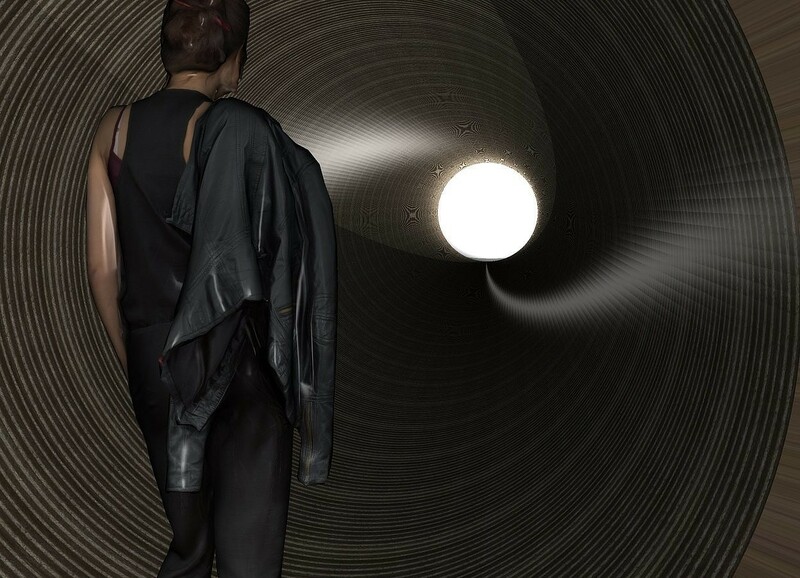 It may be a long tunnel, but . . .
@Nanook I feel ya, friend...these are troubled times we live in, but they are not as troubled as they are often made out to be. Most people are still basically good, and much of what we are seeing is the result of an unhappiness shared by most of us that we just disagree about how to fix. There is so much potential to connect if we go deeper than surface ideologies, and there is so much potential for solidarity if we allow ourselves to see both the goodness and the struggles of our fellow citizens. Everyone is hungry for some reason to be optimistic right now, and to me, there are plenty of reasons, because so much IS in our power and we ought focus on those things rather than what we cannot change. No matter what anyone thinks of the government, they can't stop us from making the world around us a bit better. It all starts with us! @igliashon yep, we're all in it together so we need to keep pushing for what is right for everyone not just ourselves. I like to think in a positive manner and remind myself no matter what this is just a stopping off place before I get to my real home and there are so many who are made to suffer real inequalities and oppressions that we have no comparisons to. So, for me, sometimes satire is a way of releasing those negative emotions that only become vitriol without an outlet. Optimism should always be a important tool in our bag and I like that you have reminded us of that. Great to have you back around :-)......and remember......what I always say...Render On ! !